We’re incredibly happy to announce that Project Integrated will be receiving support from the Malta Community Chest Fund Foundation, allowing us to extend our activities through till December 2018! This was confirmed on 18 March during a ceremony held at San Anton Palace, where the President of Malta emphasised that this year’s MCCFF aims are to support the achievement of the UN Sustainable Development Goals (SDGs). The project, implemented with JRS Malta and Integra Foundation, provides integration support to refugees as well as migrants at risk of social exclusion. We’re extremely grateful to the MCCFF for its constant support of our efforts, and for its commitment towards seeking to improve the lives of vulnerable or marginalised communities. The Prime Minister’s visit to Jordan’s Al Za’atari Refugee Camp offers Malta the unique opportunity to express true solidarity with Jordan and with the refugees living in the Camp. Al Za’atari Refugee Camp hosts around 80,000 refugees, making it more than double the size of Gozo’s population. Of these, around 30% are children. Future prospects for these refugees remain bleak. Given the drawn out war in Syria, and the pitiful number of resettlement places made available, we can say with some certainly that these refugees will remain warehoused, will limited access to basic human rights and needs. aditus foundation, Integra Foundation and JRS Malta welcome the Prime Minister’s visit to the Camp; we are confident that his interactions with the men, women and children living in Al Za’atari will sensitise him to their desperate need to have their human dignity restored. It is in this light that we strongly urge Malta to participate in UNHCR’s resettlement efforts by agreeing to resettle refugees directly from Jordan, Lebanon or Turkey. This would restore the refugees’ hopes of a future of safety, dignity and respect. Providing safe and legal ways to reach a place of safety is the most effective way to prevent refugees from resorting to unsafe and irregular means of travel to access Europe, thereby saving lives. It would also be Malta’s firm message to the European Union, and to the international community, that the current response to the refugee crisis is unacceptable and requires immediate revision. aditus foundation is an independent, voluntary & non-profit organisation established with a view to monitor, act & report on access to fundamental human rights by individuals & groups. Integra Foundation was set up with the aim of facilitating the integration of minority groups in Malta. JRS Malta seeks to accompany, serve and defend the rights of asylum-seekers and forcibly displaced persons who arrive in Malta. 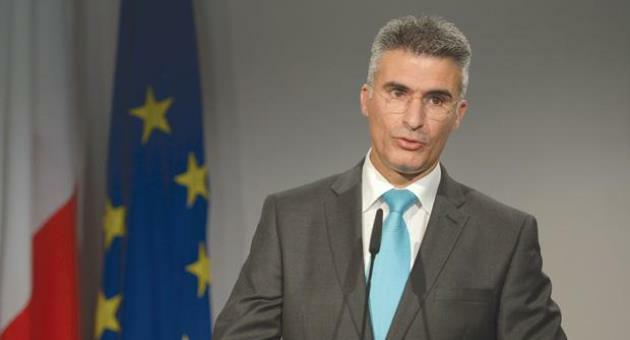 Home Affairs and National security Minister Carmelo Abela. Photo Credit: The Malta Independent. We are distressed by your public comments of 13 July regarding Malta’s hesitation in accessing the 1954 and 1961 international conventions relating to statelessness. Your comments, as reported, expressed a fear that a statelessness determination procedure could result in an administrative burden on your Ministry, in view of the possible hundreds of applications received from failed asylum-seekers. In response, we would like to make a couple of observations, in the hope that we can convince you to decide to fully engage with the two conventions as key instruments in the protection of fundamental human rights of stateless persons. Whilst the fear of pull factor or abuse of the system is understandable and not unique to Malta, we are keen to observe that current practice in those European states implementing a statelessness determination procedure seems to confirm otherwise. Among these European states, there is no evidence at all of the procedure acting as a pull factor. As an example, France’s procedure has been established for many years, and it has consistently received about 200 applications per year. The relativity of these figures is of course pertinent to highlight. Secondly, an observation on the difference between a statelessness determination procedure and an asylum procedure is a useful exercise. In the former procedure, applicants would be required to willingly cooperate with Malta in terms of enquiries made with their country of origin, or the country with which they have a potential nationality connection (e.g. through birth, descent, marriage). This means that applicants must be prepared for the possibility of this country actually confirming them as nationals and documenting them, thereby securing their removal from Malta and re-entry to this country. In this sense, it is incorrect to assume that a statelessness determination procedure would result in Malta being required to assume responsibility of hundreds of applicants. On the contrary, it could result in Malta being able to confirm a nationality entitlement and to consequently return individuals to their countries of origin. It is also pertinent to note that statelessness is an extremely specific situation, to the extent that cases clearly not presenting statelessness issues are rather easily identifiable and therefore readily processed with little resource impact. Finally, we would also wish to express our disappointment that a matter of fundamental human rights is reduced to a purely administrative and logistical matter. Stateless persons live in a human right limbo, where they are dehumanised on a daily basis. An asylum determination procedure might be useful for the resolution of some situations, but not necessarily for all as not all stateless persons face international protection concerns. It is for these persons that we strongly urge you to reconsider your stance and to actively engage with the two conventions. Malta’s commitment to upholding fundamental human rights cannot afford to remain relevant for a select few, but should be extended to all persons in Malta. To this end, we reiterate our willingness to discuss the matter further with your Ministry. Dr. Neil Falzon (Director aditus foundation) and Dr. Katrine Camilleri (Director JRS Malta). The Open Letter is available here (.pdf). aditus foundation is a member of the European Network on Statelessness.